R&D activities at VJU are being conducted with tight cooperation with partners such as Japanese universities, Vietnamese universities inside and outside the system of VNU Hanoi. The university is also developing the collaboration network with R&D enterprises in Vietnam, Japan and other countries for development and implementation of joint- or ordered-research projects. In 2017 and 2018, through an investment project of VNU Hanoi, the Government of Vietnam has invested laboratories for teaching, practicing and researching activities of 03 Masters’ Programs in VJU (Nano Technology, Environmental Engineering and Infrastructure Engineering). The laboratories have been put into operation from beginning of 2018, effectively support to the research activities of lectures and students. Besides, under support from Vietnamese Government and Japanese coordinating universities, some other devices have been additionally invested such as High Performance Computing Devices, Scanning Electron Microscope, computer system for climate change analyzing and projection. 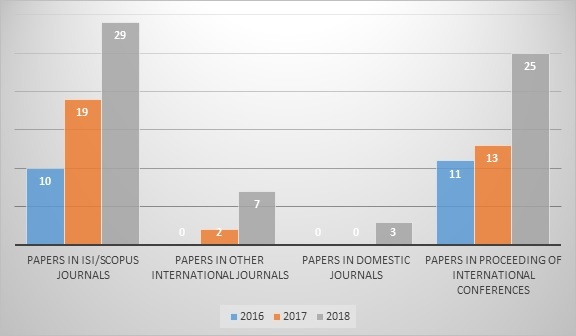 Taking advantageous from the supports of Vietnamese and Japanese Governments, as well as the capabilities of VJU lecturers in developing research proposals, the number of research project hosted by VJU is increasing year by year. The number of published papers/books also increases. Being a research oriented university, VJU is doing a lot of efforts to promote R&D activities with other research institutions and provinces. Some lecturers also form multidisciplinary groups to apply research grants from domestic and international funds (NAFOSTED, SATREPS, British Council…).